German shepherds are intelligent and hard-working dogs who need daily stimulation and physical exercise. Giving them a job, even if it’s performing obedience work, will go a long way to keeping them happy and stable. Because they’ve been bred for herding and guarding sheep, as well as for police and military work, German shepherds can be protective of their family and aloof with strangers. They are powerful dogs, but can also make great family pets if chosen from proper lines, are socialized well and receive training and exercise. With their good looks, intelligence, strong work ethic and desire to please, GSD’s have been popular in the U.S. since their earliest introduction. However, it wasn’t just their attributes that made the dogs popular, movies contributed greatly, too. Strongheart and Rin Tin Tin were two of the earliest canine stars – appearing in 1921 and 1922, respectively. 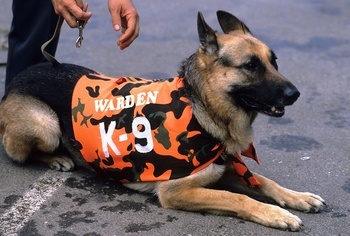 When pop culture intersected with a solidly bred dog, families throughout the country clamored for German shepherds as pets. Indeed, they’re usually found atop the AKC’s most registered breeds, taking the second spot behind the Labrador retriever in 2012. Like many dogs that attain popularity, the GSD suffers from a line split – those dogs bred for working traits and those bred mainly for looks and the conformation ring. Unlike other working breeds that become popular and then split, the GSD has been plagued by the two warring worlds since the first attempt at standardizing the breed. In fact, it led to the collapse of the Phylax Society, which first sought to create a standard looking and performing German shepherd dog. While conformation and working lines often have differing structure – a contentious topic within the breed – they are both prone to several other health issues. Hip and elbow dysplasia are two common issues that parents should be evaluated for prior to breeding, and at Paw Print Genetics, we recommend screening for as many known inherited mutations as possible. We offer screening for nine known German shepherd dog issues: anhidrotic ectodermal dysplasia, hemophilia A, hyperuricosuria, leukocyte adhesion deficiency type III, mucopolysaccharidosis VII (Group B), Renal cystadenocarcinoma and nodular dermatofibrosis. In addition to the show ring, owners of German shepherd dogs can compete in herding and guarding trials, schutzhund and agility trials, among other things.